Victims of fraud can look the same - very angry, upset and traumatised. Report on victims of investment fraud. The AARP Fraud Watch Network released a report that has identified common traits in victims of investment fraud. may reflect an accurate account for the group questioned, but concerning the bigger picture regarding 'investment fraud' the report failed to say anything about the people who followed exactly what their countries' financial regulatory system and legal processes required, but inevitably become victims of a fraud. The fraudulent Trio Capital scheme set up in Australia with it's international links, is a blight on the financial industry and often it is not acknowledged as a fraud. For example, the Australian newspaper in an article published February 2, 2017 said "Since 2009 only one APRA-regulated trustee has collapsed — Trio Capital. It was found to have poor investment governance, badly managed investment conflicts of interests and unmitigated fraud risk." The Australian Securities and Investments Commission (ASIC) and the Australian Prudential Regulatory Authority (APRA), are on record for using the word 'fraud' in relation to the Trio Capital Limited during Parliamentary Senate Oversight Hearings. Both of the Australian regulators appear to avoid using the word 'fraud' publicly - particularly regarding the collapse of Trio Capital Limited. What must be learnt from the likes of the Trio Capital fraudulent scheme is that the present regulatory regimes are not a defence against sophisticated fraud. What must be recognised is that there are people who followed the laws and regulations, encouraged by government to invest in the Australian financial market and save for their retirement but were exposed to fraud. 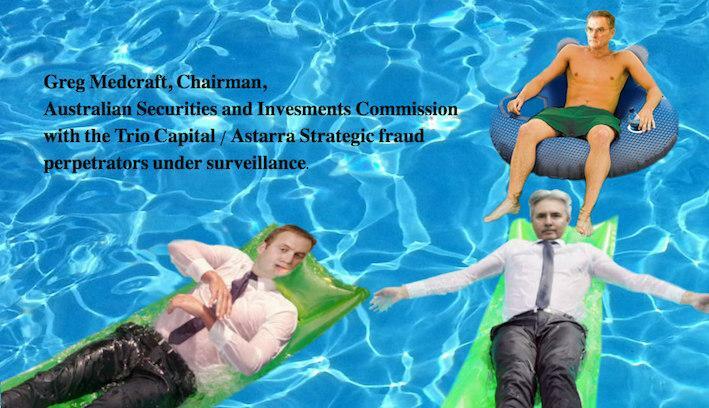 In the example of the fraudulent Trio Capital scheme, the funds were regulated and licensed by the Australian Securities and Investments Commission (ASIC) and the Australian Prudential Regulatory Authority (APRA), the operative of Trio and entities were licensed, the funds were approval by ASIC, APRA, two banks, audited by one of the world's largest auditors, approved by star rating firms, checked by risk managers, overseen by lawyers supervising compliance, etcetera - but the whole system was poisoned from the beginning by an underlying fraud structure. The Trio scheme paid attention to compliance when it set up and the regulated scheme gave investors the assurances that it was under regulatory governance. But the Trio fraud demonstrated that all the official governance amounted to nothing. The public need to be informed that by following the law, by following all the requirements set by ASIC and APRA, does not add protection against fraud. In Australia, ASIC and APRA appear to offer more protection to alleged fraudsters than consumers. An alleged fraudster is provided with confidentiality protection under Corporation Law and privacy to operate an opaque operation. Consumers are not entitled to know what the financial regulators do or don't do to protect Australian superannuation. Reports about fraud victims need to acknowledge that fraud can affect people that take precaution and follow proper due diligence. By not mentioning the word 'fraud' or by not acknowledging that people who did not take risks lost their money to fraud, does not make the issue go away. Better transparency is required.